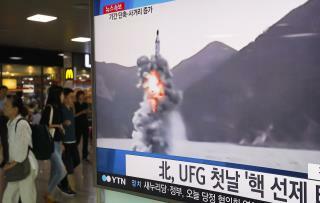 (Newser) – North Korea on Wednesday fired a ballistic missile from a submarine into the sea in an apparent protest against Monday's start of annual South Korea-US military drills. The missile fired from a submarine off the eastern coastal town of Sinpo flew about 310 miles, the longest flight of a North Korean submarine-launched missile, Seoul's Joint Chiefs of Staff said in a statement, per the AP. US Strategic Command said it had tracked the North Korean submarine launch of the presumed KN-11 missile over and into the Sea of Japan. North Korea fired two other missiles from submarines earlier this year, but they were believed to have exploded in midair after flying about 18 miles, according to South Korean defense officials. China better put a leash on it’s little boy before people start evaporating all over the planet. They can't hit Tokyo or Shanghai from that distance. The only place really within 310 miles IS South Korea...and they didn't aim it there, so...what are they trying to prove again? Maybe Obama will pay them American ransom money not to.